Join Hump Day $50 Giveaway! It’s my first time to join this giveaway, and I’m so excited! On the first mandatory entry, please write Pensive Thoughts referred you. You must complete the first 2 tasks before the others are enabled. For a chance to win an additional $50, head on over to WAHMaholic and write WAHMaholic in in entry #1. Good luck! This entry was posted in Hump Day $50 Giveaway. Bookmark the permalink. 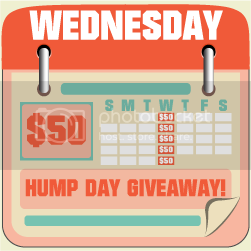 6 Responses to Join Hump Day $50 Giveaway! joined, too! + crossing my fingers! ← Great Brazilian Madness at Glorietta Activity Center!